With Hurricane Irma leaving devastation in its wake throughout the Caribbean and the U.S. state of Florida bracing for its impact, many in Costa Rica are wondering how the storm could affect this country. According to the National Meteorological Institute (IMN), the country can expect heavy rainfall throughout Saturday afternoon and evening, into Sunday, in Costa Rica’s southern Pacific region, Central Valley and the Nicoya Peninsula. These regions could see 100-150 mm (approximately 4-6 inches) over a 24-hour period, the IMN stated on its Facebook page. The IMN forecasts a smaller impact on the Northern Zone and Caribbean region, as well as the northwestern province of Guanacaste, expected to experience isolated rainshowers and moderate wind. The institute recommends precaution in areas vulnerable to landslides and flooding, and for drivers who may experience reduced visibility. The National Emergency Commission (CNE) indicated that it has declared a Green Alert (Informative) for the Caribbean region, Northern Zone and Central Valley, with a Yellow Alert (Preventive) for the entire Pacific coastal region. Those planning to take to the waves on the Pacific side should be very careful over the weekend, according to both the IMN and the University of Costa Rica’s Center for Marine and Limnological Studies (CIMAR). A warning published on the CIMAR website predicted big waves and strong winds on the Pacific side: today (Friday), and then again on Sunday and Monday. At the time of the publication of this article, Hurricane Irma is classified as a Category 4 storm. It made landfall on Wednesday and has left devastation in its path across the Caribbean. It is expected to reach South Florida this weekend. The storm has caused flight cancellations from Costa Rica to the affected areas. The National Emergency Commission (CNE) indicates that passengers affected by the situation can call 506-2666-9600 for more information. Unlike Irma, the massive earthquake in Mexico that killed at least 40 people Thursday night in the southern states of Chiapas and Oaxaca did not cause any significant impact in Costa Rica, according to CNE posts. According to AFP, President Enrique Pena Nieto described the 8.2 magnitude quake as “the largest registered in our country in at least the past 100 years” – even stronger than the 1985 earthquake that killed more than 10,000 people in Mexico City. 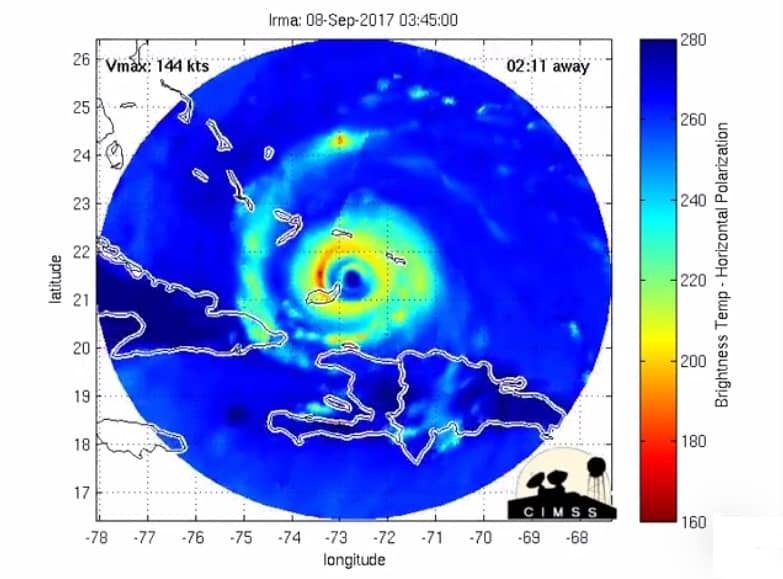 Animación del radar a bordo del satélite meteorológico siguiendo la ruta del huracán Irma.